A print of Old Govan from 1903,the paddle steamer is the Strathmore. 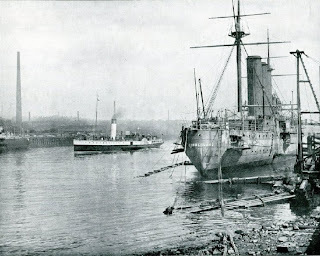 The ship is the Monmouth-Class armoured cruiser HMS Cumberland, fitting out after launching, at the Middleton Yard of the London & Glasgow Shipbuilding Company, Govan. She displaced 9,800 tons and was launched in late 1902. The Middleton shipyard (founded in 1842 by Smith & Rodgers) was situated where Harland & Wolf bought into around 1912, i.e. near the Govan Drydocks.